How does collaborating on ATLAS benefit Canadians? Particle physics challenges both the technological and intellectual boundaries of humanity. Participation in ATLAS and the LHC keeps Canada at the forefront of accelerator research, information technology, and radioactive particle detection, to name only a few areas. Particle accelerators, while originally developed for particle physics research, are now widely used for diverse applications such as cancer therapy, studying viruses, designing new drugs, and developing new semiconductors and microchips. Offshoots from Particle Physics detectors form the cutting edge of medical imaging devices, and the two fields maintain close collaboration. The World Wide Web was originally developed by particle physicists at CERN as a means of sharing data, and the "Grid" -- sharing computer power over the internet -- is a spinoff of the LHC and ATLAS. Canada's role in ATLAS and the development of the ATLAS analysis centre at TRIUMF is pushing Canada to the forefront of global information technology. As Canada's economy shifts from resource-based to knowledge-based, scientists and technologists trained on ATLAS are invaluable contributors to fields as diverse as journalism, banking and advanced technology research and development. 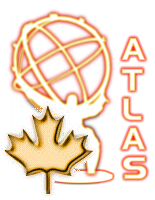 ATLAS-Canada motivates some of the brightest and most dynamic students in Canada into pursuing advanced degrees, many of whom take that training and become leaders throughout Canadian industry and business. More information can be found at the Canadian subatomic physics website.